Named for its two central rivers, the Sacramento-San Joaquin Delta is the upper part of the San Francisco Bay, the largest estuary on the Pacific coast of the United States. 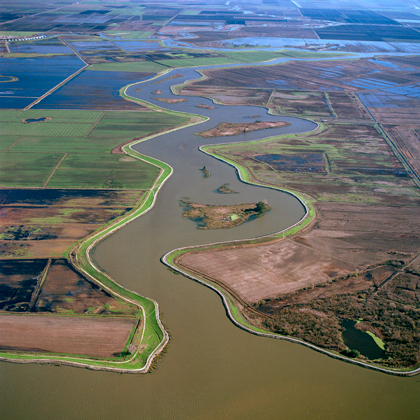 The Delta provides California with an aquatic lifeline-irrigation for more than a million acres of farmland, water supply for 23 million residents, and critical habitat for migrating birds, two-thirds of the state's salmon and many other aquatic and terrestrial species. The watershed of this large inland river delta includes nearly 40 percent of California and extends northward into Oregon. Much of the Delta's flows are currently diverted to millions of acres of farmland and residents, mostly upstream of the Delta, but also from pumps within the Delta. However, earthquakes, floods, droughts and non-native species are pushing the Delta into a crisis. Researchers at the UC Davis Center for Watershed Sciences are at the forefront in providing policymakers with the scientific information and analysis that can help identify and evaluate solutions to preserve the Delta's many environmental and economic services. In addition to broad and focused studies, the Center also develops analysis to provide new insights for on-going strategic planning efforts and to better evaluate proposed future policy decisions. A less visible, but perhaps more important method of translating our work into tangible change in the management of the Delta and California water in general is through our students. Most of the graduate students and research staff who work on our projects remain within California, working as agency, water contractor, consultant or non-governmental organization staff. In this indirect, long-term way, this project improves the technical capacity of these organizations.